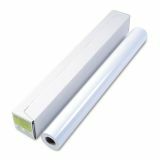 HP DesignJet Large Format Paper for Inkjet Prints, 7 mil, 36" x 100 ft, Satin White - Semi-gloss photo paper is an ideal, fingerprint-resistant choice for presentation graphics, indoor displays and color presentations. Satin finish delivers professional-looking results and reduces glare from indoor lights. Design allows a variety of laminating and mounting techniques. Photo paper is universally compatible with HP Designjet printers and non-HP, large-format printers.